Tempura is one of the most popular type of Japanese food that is widely enjoyed around the world. Among all kinds of tempura, Shrimp Tempura (海老の天ぷら) is probably most common one as you see on menus in Japanese restaurants. Besides being a standalone dish, shrimp tempura is also served as part of donburi (Tendon 天丼) or noodle soup (Tempura Soba/udon). In Japan we call Shrimp Tempura Ebiten (エビ天). Ebi means shrimp and ten comes from tempura. 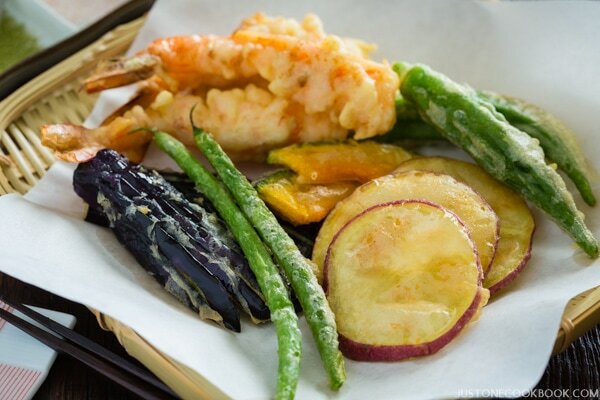 Seafood is often used as ingredients for tempura besides vegetables and among seafood, shrimp is definitely the most popular. When you order shrimp tempura at Japanese restaurants, it’s usually coated with crispy tempura batter crumbs. The cooking method when tempura batter bloom like flower in hot oil is called Hanaage (花揚げ), hana means flower and age means deep frying. Did you see the person dip his hand in the oil??? Crazy, isn’t it? 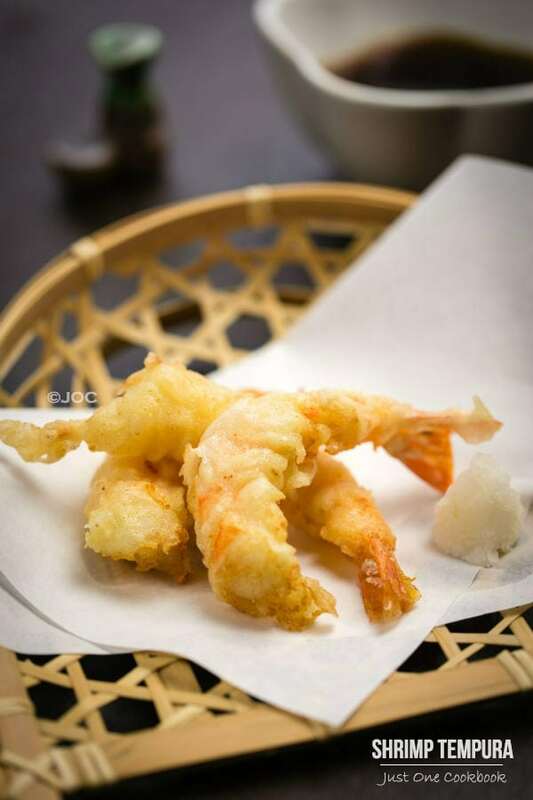 However, if you go to tempura restaurants in Japan (yes, there are tempura specialized chefs in Japan), they will not serve shrimp tempura with excess batter because they want you to enjoy the flavor that comes from the ingredient and not to be distracted by the crispy tempura skin. You will see shrimp tempura with extra crispy batter on a noodle dishes or tempura donburi dishes. At home, most people don’t make shrimp tempura with Hanaage technique as it’s more difficult. We simply coat the shrimp with batter and deep fry. Here are some helpful tips on making tempura. Keep all the ingredients (flour, water, egg) cold. Never overmix the batter, and it’s okay if there are some flour lumps in the batter. Start deep frying as soon as you make the tempura batter. Keep the oil temperature steady at the same temperature. 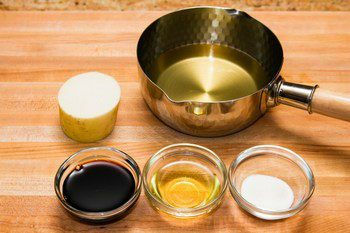 Just half of oil surface should be covered with ingredients. I hope you enjoy making this Shrimp Tempura recipe! If you try it, don’t forget to share your picture on Instagram, Facebook, or Twitter with #JustOneCookbook. Thank you so much for reading, and till next time! 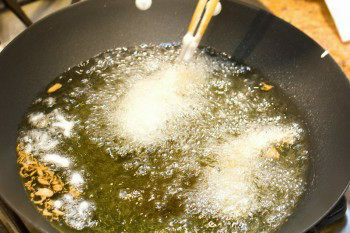 To make tempura sauce, combine dashi, soy sauce, mirin, and sugar in a small saucepan and bring it to a boil. Then lower the heat and let it simmer until sugar is completely dissolved. Remove from heat and set aside. 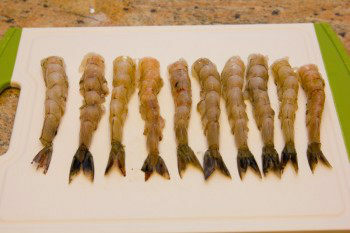 To prepare shrimp, read step-by-step instructions with pictures on How To Prepare Shrimp for Shrimp Tempura to make shrimp straight. In a deep fryer, heat 1 1/2" (3 cm) of the oil to 338-356F (170-180C). You can check the temperature with chopsticks or with a thermometer. When you see small bubbles around chopsticks, it’s pretty much ready for deep frying. If you want to read more about deep frying method, please read How To Deep Fry Food. 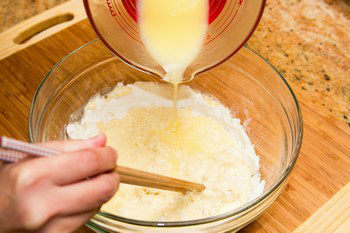 To make tempura batter, sift the flour into a large bowl. 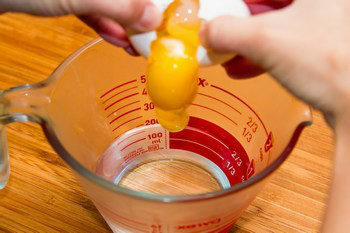 Add the egg into very cold water. Whisk the egg mixture vigorously and discard the form on the surface. 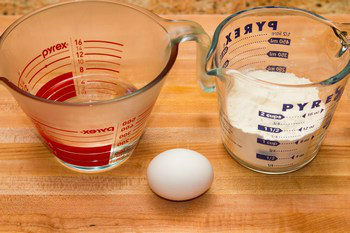 As you slowly pour the egg mixture into the flour, mix the batter but do not over mix. It's okay to leave some lumps in batter. Keep the batter cold all the time. Dust corn starch on top of shrimps. Coat the shrimp in batter. Deep fry until golden brown, about 2 minutes. Do not crowd the fryer with shrimps; leave at least half of oil surface empty. Don't over cook the shrimp as they becomet tough texture. 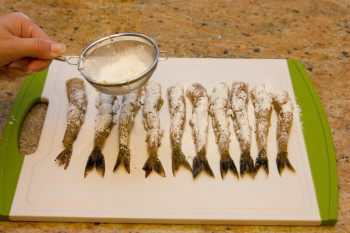 Transfer cooked shrimp tempura to a wired rack or a plate lined with a paper towel to drain excess oil. 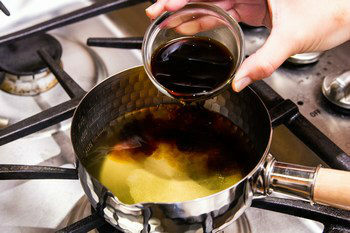 Between batches, remove the crumbs which will burn and turn the oil darker if left in fryer. Grate the daikon and squeeze the liquid out. Serve shrimp tempura with warm tempura sauce and grated daikon. 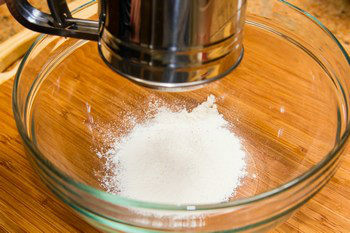 Make batter right before deep frying to avoid activation of wheat gluten. When you put too many shrimps, the oil temperature will drop quickly. Make sure to keep the right temperature for frying at all times. 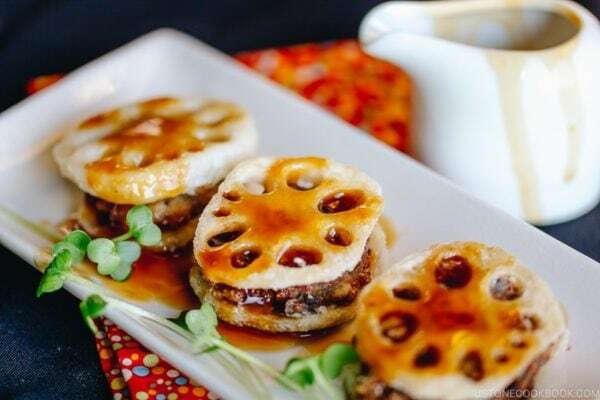 For vegetarian tempura, you can use vegetables such as sweet potato, kabocha squash, lotus root, king oyster mushrooms, etc. Instead of regular dashi, vegetarians can use kombu dashi. 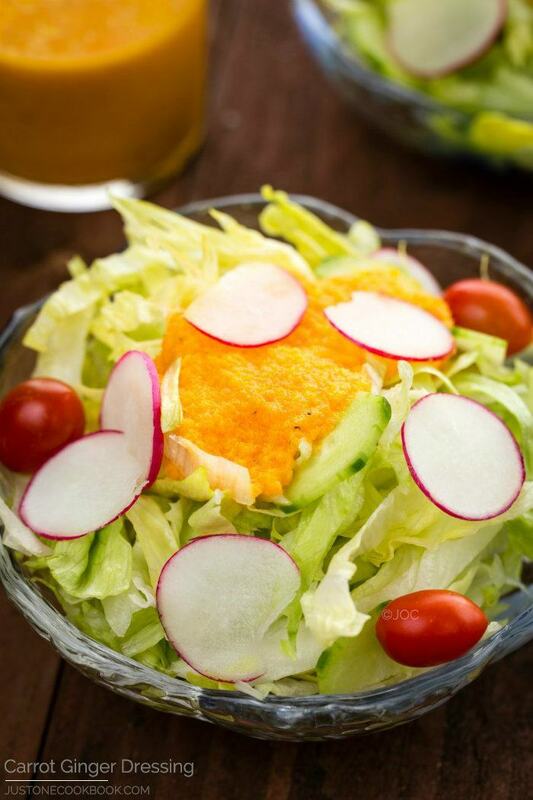 Editor’s Note: Photos and recipe updated in November 2013. Namiiiiiiii, you can’t do this do me!!! I love tempura (never made it, though) and I loooove shrimps! I must try these… NOW (well, not now now… It’s 9:30 AM :D)! Nami, we ordered Tempura whenever we take meal in Japanese restaurant, especially my daughter and I love it! Thank you so much of sharing this recipe and the good tips on how to get crispy Tempura, am going to try soon. Nami, this is what I call the complete guide to shrimp tempura! I have never posted shrimp tempura although I make it sometimes: my shrimps were always extremely curled (instead of the belly cuts etc.) and only a week ago I realised I kept on using the wrong type of shrimp…. They were very thick but short. Now I know where to find the ones from your photos and hope I’ll manage to make them! Looking at your step by step photos I want to have tempura now! The video is fantastic! This person must do tempura very often… I find myself more and more resistant to heat every year. I think hands simply get used to this, but he is incredible! Ohh… U just a helper!! Looks better then anything I have seen in any restaurant! Lucky family you got there! I guess he’s been doing that every day and oil to him is just like water! You can substitute with veggies like eggplant, kabocha, shiitake mushrooms, sweet potatoes, green beans, asparagus, shiso leaves, etc. In Japanese restaurants in the US, you also see broccoli, zucchini, carrot etc although they are not very common ingredient for tempura in Japan. Very interesting tip to include ice cubes in the batter. I’ve seen the batter being mixed over an ice bath but adding ice cubes is much easier. I like such tips. I actually thought of tempura when I got up this morning, its been a while since I had it! Nami you’ve absolutely no clue how much I love shrimp tempuras. I am so craving one NOW! I indulge in these when we have the Dubai Shopping Festival…. that’s when they set up the Global Village. And i make it a point to go to the Japanese Pavillion just to eat prawn tempuras. Jiro loves shrimp tempura but I seldom deep fry at home. One of his favorite dishes is tempura udon. Thanks for the tips on making the batter extra crispy. Tempura looks delicious! I love this post and the youtube video is interesting! I really want to try tempura! I have heard so much about it, seen so many tutorials on how to make the perfect ones that i can’t wait to actually try it! What vegetable do you think I can use to make tempura? Hi Chinmayie! You can substitute with veggies like eggplant, kabocha, shiitake mushrooms, sweet potatoes, green beans, asparagus, shiso leaves, etc. In Japanese restaurants in the US, you also see broccoli, zucchini, carrot etc although they are not very common ingredient for tempura in Japan. Hi Mai! You can substitute with veggies like eggplant, kabocha, shiitake mushrooms, sweet potatoes, green beans, asparagus, shiso leaves, etc. In the Japanese restaurants in the US, you also see broccoli, zucchini, carrot etc…although they are not very common ingredient for tempura in Japan. Oh my, I haven’t had tempura in so long and these look amazing! Yum 🙂 I love your step by step pictures, those are incredibly helpful! Yum yum yum! Shrimp Tempura is one of Trinity’s favorite dishes! Everytime we go to our favorite Japanese restaurant, her usual is a plate of shrimp tempura and a side order of fried rice, they would be gone before my spicy tuna rolls even arrive! Thanks for sharing Nami! Ooohh…. I love shrimps, this is one of my favorite. Yours looks extremely good and delicious. Oh Nami, now it is I who wants to be your neighbour. I love tempura prawns especially in soba noodle soup. I don’t deep fry that much. I’m very accident prone. The guy in the video seems to be swirling the oil with his bare hands! Talk about asbestos fingers. yummy! something I won’t do at home is fry (too messy) but I will admire your tempura from here. MMM!!! This one is another hit for me!! Most of my friends love sushi and we have this wonderful sushi restaurant here, I got a “crunchy” sort of roll, that had shrimp tempura in it. I ordered it for myself, thinking no one else would want it as it was tempura and ended up with only one piece as everyone else loved it too! I was waiting for you to post this!! Thank you! 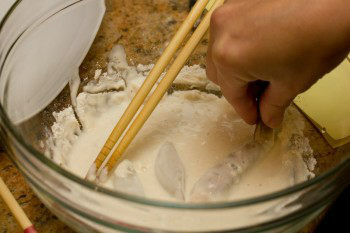 I love tempura- I didnt know the trick of adding ice cubes to the batter! So smart Nami chan! 🙂 I love enoki mushroom and eggplant tempura, oh and green beans too! My best friend likes this one place that does tempura natto. Your pics made me crave japanese- so that is where I am heading for lunch! YAY…!!!! Finally the recipe is on :D)!! Thank you so much, Nami…:)! The tempura looks gorgeous and I am so going to make it…:)!! Pity that it’s so late already here, or I would have tried your tempura recipe :)! If I don’t arrive home too tired tomorrow, I’ll definitely give it a try and make myself happy (just like your husband and kids ;)!!). Btw, you’re right, that guy is crazy, dipping his hand in oil…! I guess he’s so used to making tempura, he doesn’t notice the heat anymore ;)! What a beautiful job you did with these, Nami. And I can see why they never stuck around long enough for you to take pictures. I’d be all over those! PS – interesting you should think that the word “Nanaimo” sounded like Japanese..it’s the name of a city on Vancouver Island, but it is definitely a First Nations (Native American) word, so I imagine that the roots of the two languages are somewhat similar. Another great recipe Nami. I love stopping by to get inspired. Your tempura looks perfect. I get such a kick out of the Cooking Gallery`s bento recipes. I wish I had known about them when my kids were young. I will save this recipe for my BF: he loves shrimp and tempura!!!! Nommers Nami “giggles” I think that rhymed! The tempura looks superb! Whenever I order Udon, I always skip the noodles and go for the goods! Nami, your tempura looks absolutely gorgeous!! I bet it’s delicious too..definitely not easy to achieve a good tempura 🙂 Thanks for sharing! These look so crisp and light. I’m always a little frightened to try Tempura but you make it sound so easy I might just try it. Some foods are SO hard to photograph, but you certainly did these justice! They look delicious! 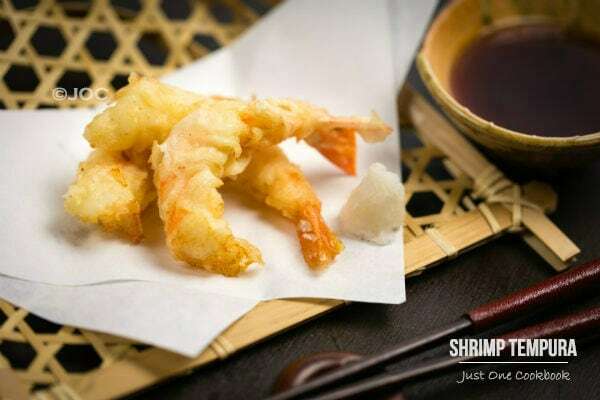 Nami, the shrimp tempura looks so good…almost makes me want to eat shrimp. I’m not a shrimp fan but I do make it for my family. I like you step-by-step and how-to tips. Do you use all purpose flour?, for some reason I thought rice flour. I don’t deep fry too often so this will help me want to do it right! I find it interesting that the veggies you said to use all have a pretty high water content. Does that help them turn out better when deep frying? I couldn’t watch the video, (I’m on a different computer) I’ll try later! Thanks CG, great suggestion! Great Post Nami! Your picture looks perfect! I wish my kids liked shrimp. I never make it at home, but always order it when we go out! Gorgeous shrimp tempura (one of my favorites). This looks delicious! Can’t believe that guy has his hand in the oil, that’s insanity! You make everything looks so easy to make. Hubby and my mother in law loved shrimp tempura. Depending on how Tiffany feels I may make some these days. I could not keep watching the video any longer…watching this guy keep putting his fingers into the steaming hot oil, just gave me the “creeps”…no sensory feeling in his hands? 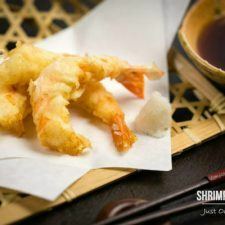 Love your shrimp tempura, and the perfect recipe! 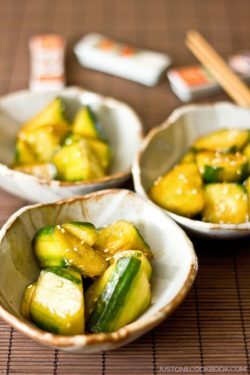 I also love veggies dipped into the tempura batter, as well! Great recipe, and totally professional presentation along with the video, as well! Nami – you just got me very excited and hungry at the same time. It’s almost midnight in Malaysia, but now I can only think of some crunchy delicious tempura. Yum…As always, your tutorial is excellent! I love your trick of getting that restaurant style skin. Awesome recipe Nami! That is such a great tip about the temperature difference, I didn’t know that! Do you not use panko breadcrumbs for tempura? I’ve also heard that a little bit of sparkling water or seltzer in the batter helps keep it light and crisp, have you heard of this? I can’t wait to try!! Thank you Katherine! No, we don’t use Panko for tempura. When it is coated in Panko, we call it Ebi Fry (Fried Shrimp) in Japanese and it’s quite common menu at home and Japanese restaurants. I learned about the sparkling water technique from fish and chips batter. “Traditionally” tempura recipe doesn’t include sparkling water (plus it’s not widely known or “common” drink in Japan). I think I should give it a try with cold sparkling water instead of iced water next time to see the difference! Thanks Katherine! I love the pictures! And I love tempuras, especially shrimp ones 🙂 In home, my mom sometimes uses squids too. Thanks for the article on how to devein and prepare the shrimps, I always wondered how restaurants get their shrimps’ tails so nicely shaped. Nami, sorry this is late. Super post, as ever – gosh, that video with the tempura-d fingers is something else! Love your shrimps all neatly laid out, awaiting the magic dip. It’s ages since I made tempura and you’ve inspired me to get back on it again. It always seems such a song and dance in the kitchen, but it’s SO worth it. Yours looks fantastic! Nami, my other half is a chef in arestaurant and his best seller is tempura prawns! He hates them because everybody orders them!! I’m going to show him this recipe, I think he uses beer or fizzy water though. He wears gloves to dip them in the fryer not like that nutter in the video!! Nami, you are always my favorite cooking teacher! I have always wanted to make tempura but haven’t tried it yet. Fortunately deep-fried batters, doughnuts, etc. translate to gluten-free cooking easily. I never knew the proper name of the dipping sauce either (tentsuyu) so now I feel properly educated! Hope you are having a wonderful time with your mom! love love love shrimp tempura…thanks for the detailed instructions! I love shrimp tempura but have never known how to make it. I feel like I get an entire education in Japanese cuisine following your blog Nami. Thank you! Aw, the video above doesn’t show up for me – The whole “dipping the hand in oil” thing though – I assume that’s working on the same concept as the idea they tested on that TV show, Mythbusters, where you can actually plunge your hand into molten aluminium with no problems if you do it in a special way. I think I’ll leave that for the braver people though. When you say “add more batter with a spoon”… is it just a case of picking up the shrimp and dribbling some batter over it, or can I re-dip it in the batter or something? It shows on Firefox. I think some users told me Internet Explore 8 doesn’t render correctly. Haha that’s scary! I think they make tempura everyday that skins got tough and tip of their fingers don’t feel anything…. I always like a cook that does not hide any information. You really share all you know. 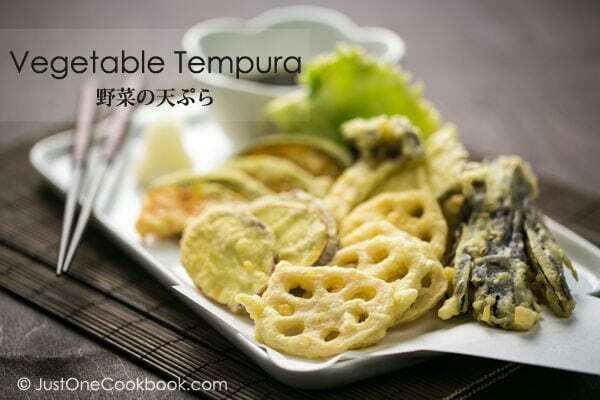 I just loved the tempura recipe which I am going to try today, thanks so much for sharing this recipe, every time go to a Japanese eatery I always have tempura. I just tried this recipe yesterday. It was nice n crunchy right after frying but my only problem was the shrimp tends to get soggy after a while. Do you know what I am doing wrong? By the way, I tried your chawanmushi recipe. It’s excellent. Exactly like those in the restaurants. My 3 year old daughter is a picky eater but chawanmushi wins every time. She finishes it all!! Hi Mary! Tempura is meant to be eaten right after being deep fried (the best experience is to eat tempura at the bar in tempura specialized restaurant). It will never been crispy and crunchy like the moment you deep fried after a few minutes. It’s hard to tell what went wrong as I wasn’t in your kitchen, but you can try your best to remove excess oil when you pick up tempura from oil. Extra oil definitely makes it soggier. And if you have a wire rack, please use it instead of paper towel, so it helps moisture to escape from the bottom of tempura. Hope this helps! THANK YOU MUCH!!!! The tempura was simply PERFECT!!!! Light and crispy. Hi Nami! I just found your tempura recipe and I would like to give it a try. Would it be okay to use baking soda instead of baking powder? Or will it make a huge difference? Thanks and keep it up with this great blog! Btw, I also found another tempura recipe that uses a whole egg, not just the yolk. How does using or not using the egg whites affect the finished product? Thanks again! Hi Neko! Baking powder and baking soda are both leavening agents, and even though they are not the same chemical we can substitute one for another in recipes. Hi there! You have a really wonderful site and I love the way you show how easy some of this stuff is (I really feel like I could make them haha). I just have a question about the garnish in this recipe. 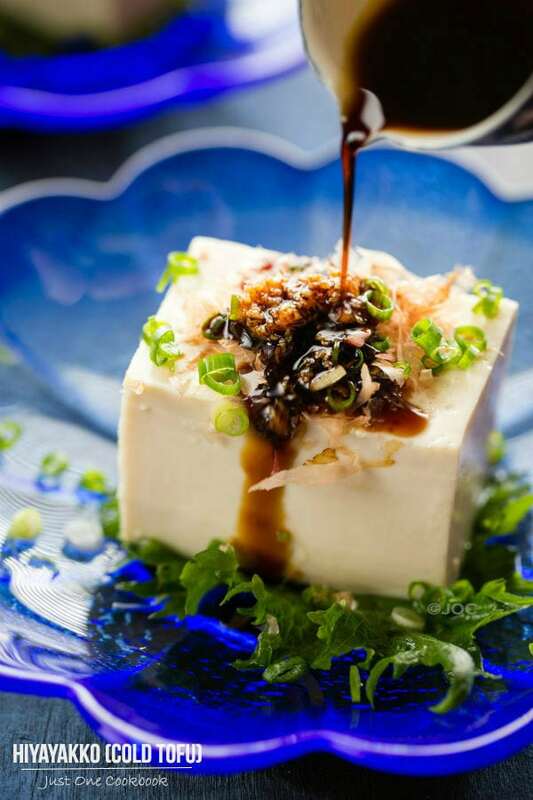 Now this may sound kinda dumb, but do you want to include the liquid from the daikon? Or is it like you squeeze it out from the grated pieces then put those into your sauce? Just a little confused sorry. Hi Keegan! Thank you for your kind words! I’m glad to hear step-by-step pictures are helpful. 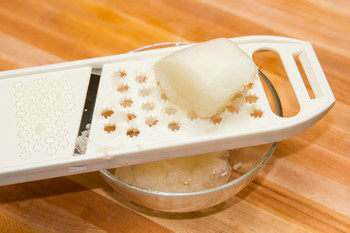 For grated daikon, I squeeze most of liquid, but I won’t squeeze really hard, just enough moist (but not dripping). Hope that helps! Thanks again! your recipe and tips allow to replicate quite easily. We’re in the process of completely renovating several rooms in our home, one of which is our kitchen, and I can’t wait till it’s done so that I can try your delightful Japanese recipes! PS. You have a lovely family! PPS. I’ve created a new board on my Pinterest account so that I could post a note about your beautiful blog and delicious recipes! It’s called “Fav Food Bloggers ♥”. I want all the shrimp tempura. Nami – You should know that I found your website through a google search on shrimp tempura. I was amazed with your step by step picture instructions on preparing the shrimp tempura and subsequently got hooked with your other recipes. I did make shrimp tempura and it was a huge success with my guests. I also appreciate your explanation on why we have to follow certain steps. Helps me to remember what I should do or avoid. Thanks so much for your good work on your blog. Hi Alana! I’m so happy to hear my instruction was easy to follow – that’s one of my goals when I write my recipes. I’m glad shrimp tempura came out well. Thank you so much for your feedback! Whoa. That’s some tempura. I have a new found respect for restaurant tempura (done the way in the video). 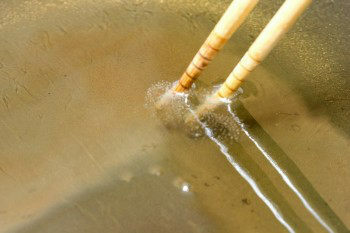 My chopsticks simply aren’t long enough as I hate hot oil on my skin…but I then again I love tempura so I persevere! Thanks yet again for an informative lesson! i was just wondering, what type of shrimp best soothes making tempura? I made the shrimp tempura last night. I was wondering if the oil temperature was correct? Usually frying oil is 375. It seemed to take forever to get golden. Also my batter was too thick I think. Perhaps I was too cautious about over stirring it.? Hi Nanette! Oil temp should be 170-180C (338-356F) which is very standard for shrimp tempura in Japan. 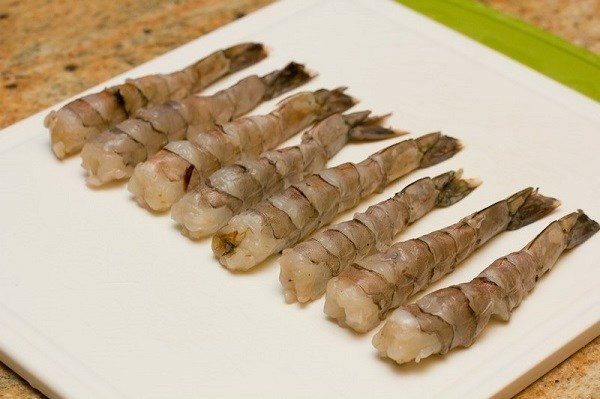 You want to make sure shrimp is thoroughly cooked, and when you fry at 375F (190C), the outer layer gets golden brown way too quickly before shrimp is cooked. So in order for shrimp to be cooked inside and outside is not dark burnt color, you need your oil to maintain between 170-180C. Hope this helps! Just followed this tempura recipe to the t and it was amazing. Thank you, I can make tempura now. Thanx so much for the wonderful AUTHENTIC recipe Namiko! Daikon is impossible to find here in Greece, what should we substitute with? Can we omit it? Sorry if this sounds stupid, we don’t have any experience with authentic Japanese cuisines. sake is not available in the middle east, any replacement? Hi Romeo! You can skip and replace with water. 🙂 Hope you enjoy this recipe! I followed this recipe for Dragon roll, the result is it is not crispy at all. Not sure what I did wrong. Hi Teh! As you can probably imagine, it’s really hard to know what went wrong without being there. My first guess is that your oil temperature was not optimal so the batter soaks up the oil. But I didn’t see how you make it, so I could be wrong. Tempura making is really up to the deep frying skills and using the correct batter. I assume your batter is correct, so I think the deep frying part could cause the issue. for the batter can you not use egg, but just ice water (with ice) and potato starch? Hi Spencer! Glad to hear you had a great time in Tokyo. Thank you for reading my blog! I would like to know whether it could be cooked ahead,because I would like to offer it to guests coming and I don’t have time to do it at the moment and keep it warm to serve it everyone at the same time. Hi Silvia! You could cook ahead, but tempura is meant to serve right before it’s eaten… so if your guests eat shrimp tempura for the first time, I recommend serving crispy tempura right out of the deep fryer. 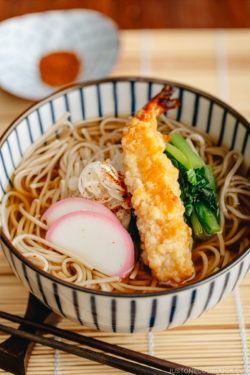 I have a question about the dashi used in this recipe. I have faced confusion all over the internet about how much hondashi to use when making dashi. In your “how to make dashi” article you reference a much lower ratio of granules to water (I think it was ~1 tsp per 2-3 cups) than you do here. Is it just that this recipe calls for a stronger dashi? When you make udon what ratio of granules would you use? I used 1 tsp to 1 cup of water when I made dashi for your beef udon and it came out great. I love Japanese culture & cooking! Pls sent me any tips on preparing Japanese food. I have a tiny weiner, how would I go about deep frying it? Gonna make this recipe today, hope it turn out good like yours ???? The sauce was perfect. However, the batter wasn’t crunchy. I think I followed all the instructions, but can anyone think of how I could have messed up the recipe? Thank you. I made the tempura for dinner but fish not shrimp. Very good batter because yes i agree with you coasting did not overpower the fish. Am excited to do all veggies. Thank you. Love your recipes. What if I didn’t have cornstarch to dust the top of the shrimp? Thanks for posting this recipe Nami 😊🙏🏻 Now I can remake that tempura I had my Japan trip in Japan. Do you think I can also use fish for tempura? Will it be using the same method as shrimp? Thanks Nami! Hi Ony! Yes, you can use fish for tempura. We usually use white fish. Since it’s smaller/flat pieces, cooking time will be about the same time as shrimp. Enjoy!